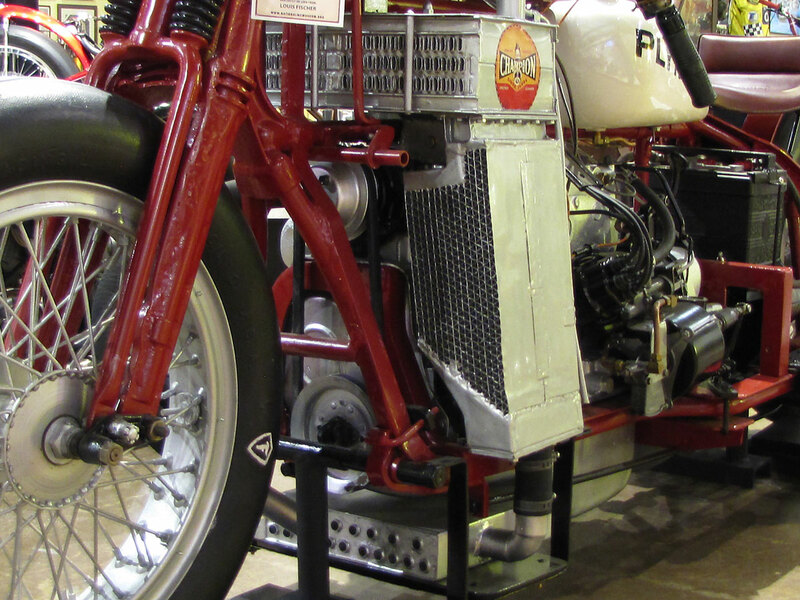 Thinking a good sized car engine in a motorcycle frame was the answer to a motorcycle land speed record, in 1933 Fred Luther set about building his dream, and hoping for a $30,000 payday if he succeeded. Not so strange. Later, guys like E.J. 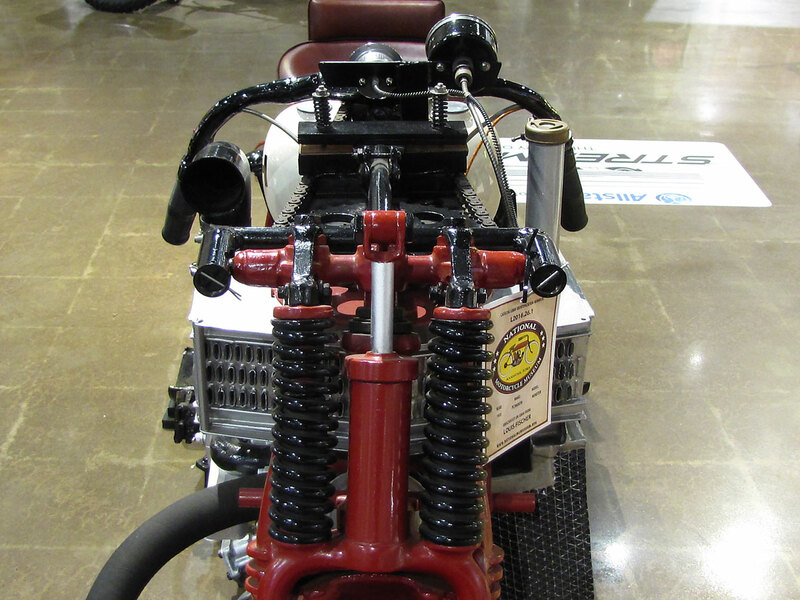 Potter and Tom Reiser were similarly inspired, but built machines for the quarter mile. 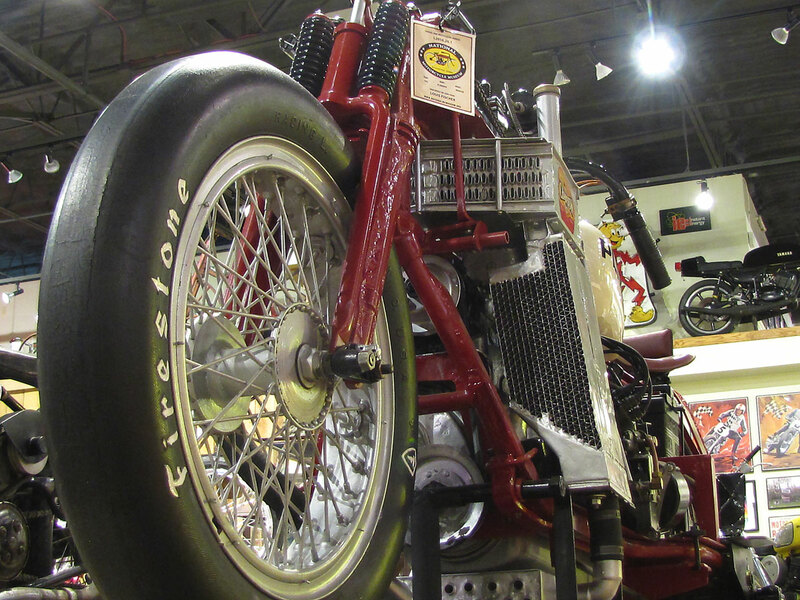 Fred Luther began dirt track racing was he was 17, went pro in 1912 at age 20. 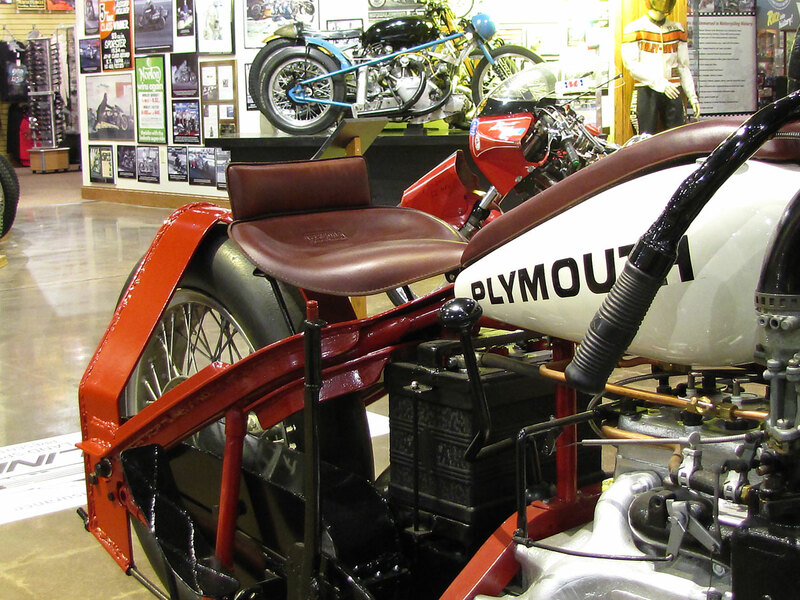 He earned a living motorcycle racing, according to a 1935 Popular Mechanics story on him and the Plymouth Monster land speed record bike. Luther had time on the board tracks, did three years on the boards in eastern U.S. cities, was also noted as a First World War hero. 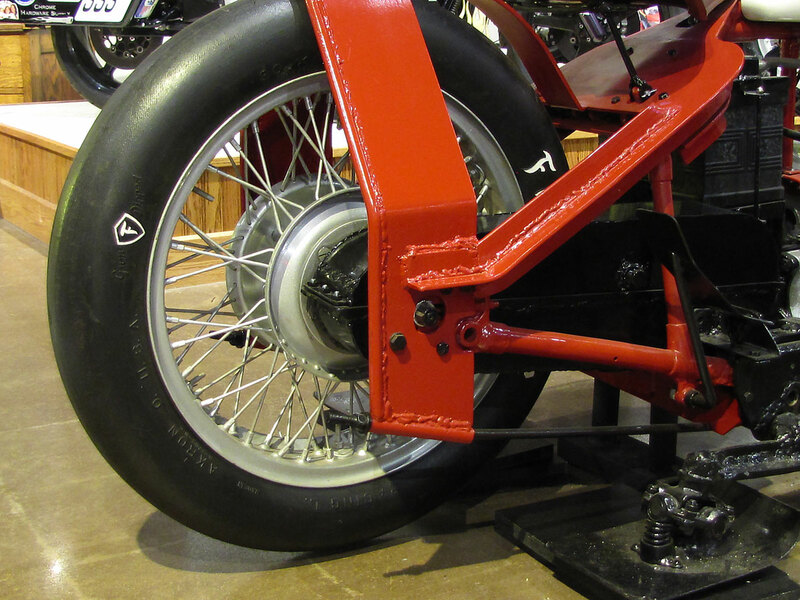 In 1929 after the War he opened a bike shop, became friends with tuners and was known to the corporations who supplied teams with tires, fuel and other racer commodities. 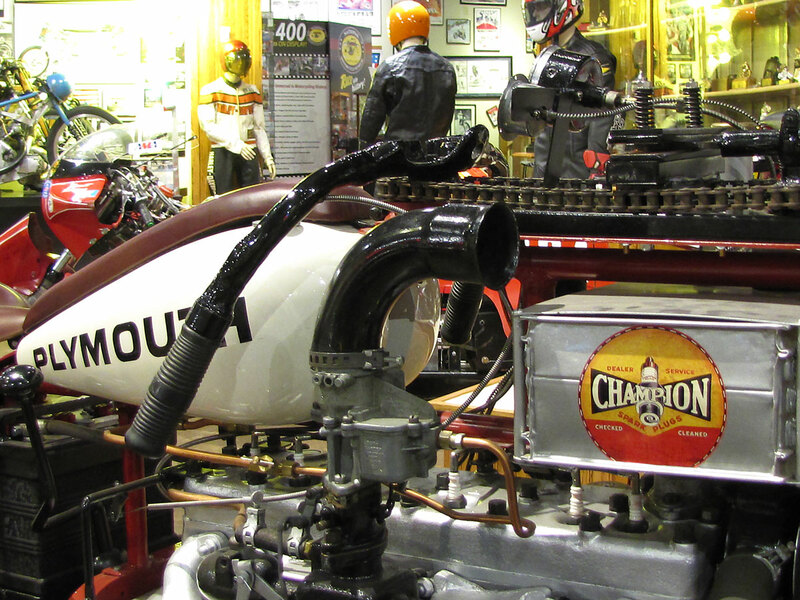 His dream became a AAA sanctioned land speed record effort at Bonneville Flats, Utah, so he could tap these connections for some help, and contingency money should he win a record. 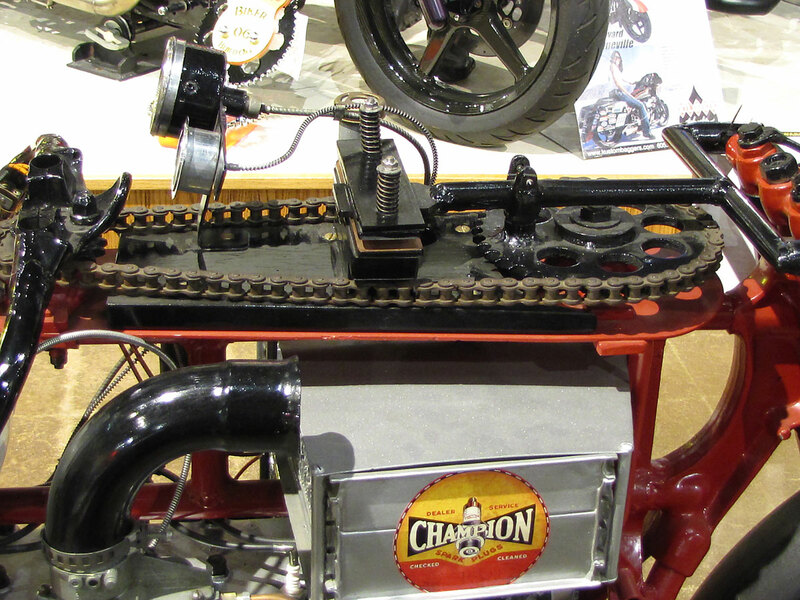 It was said that a 200mph run would bring him $30,000 in prize money, a huge payday in 1935! 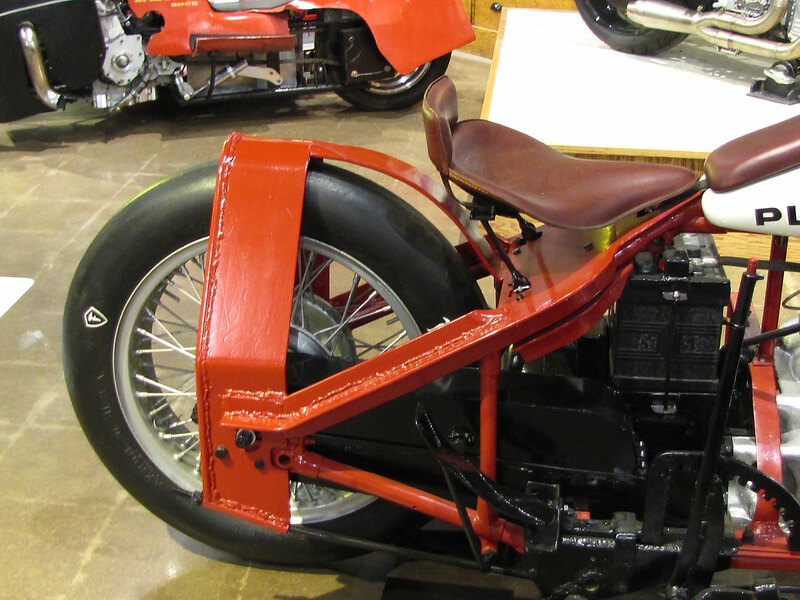 In 1934 Fred Luther put his build team together. 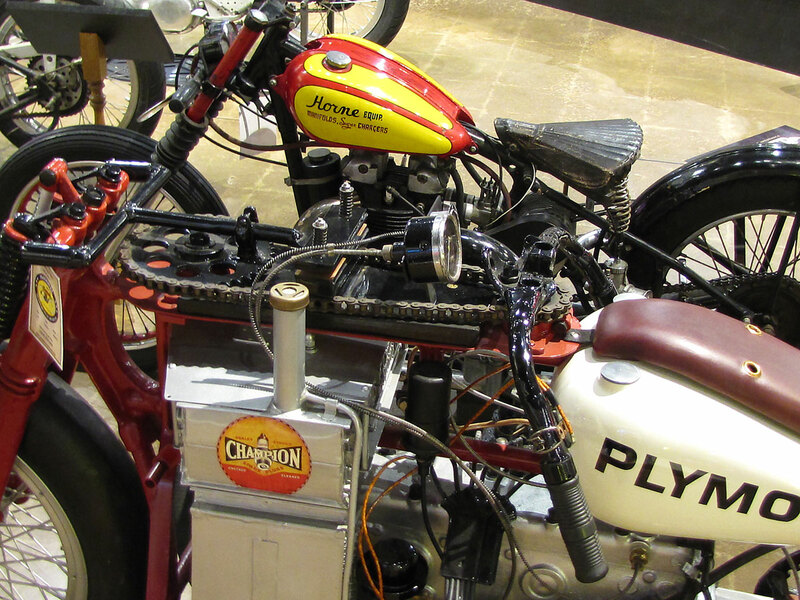 Luther tapped Cyclone motorcycle engine designer Jimmy McNeil to rework the Chrysler-donated Plymouth flathead. 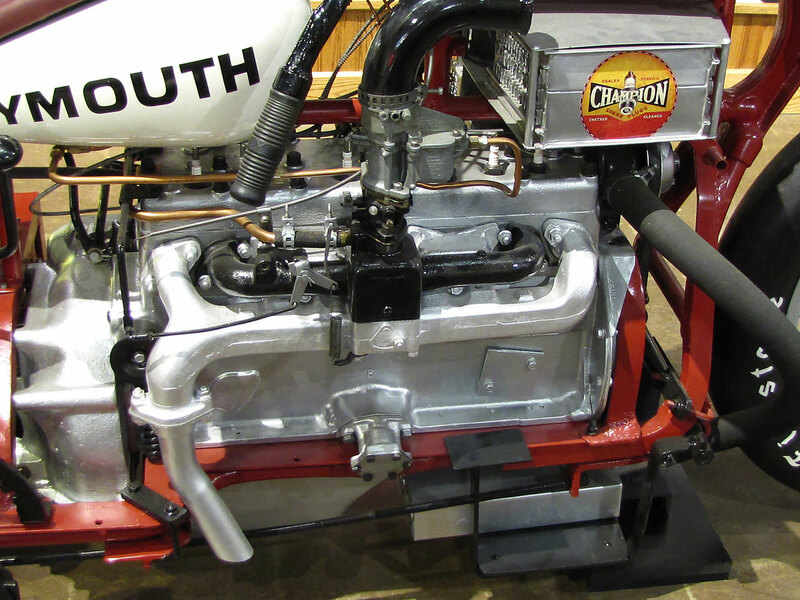 At 77HP stock, McNeil upped the compression ratio, added more carburetion, constructed three radiators to keep the engine cool, kept the electric starting. 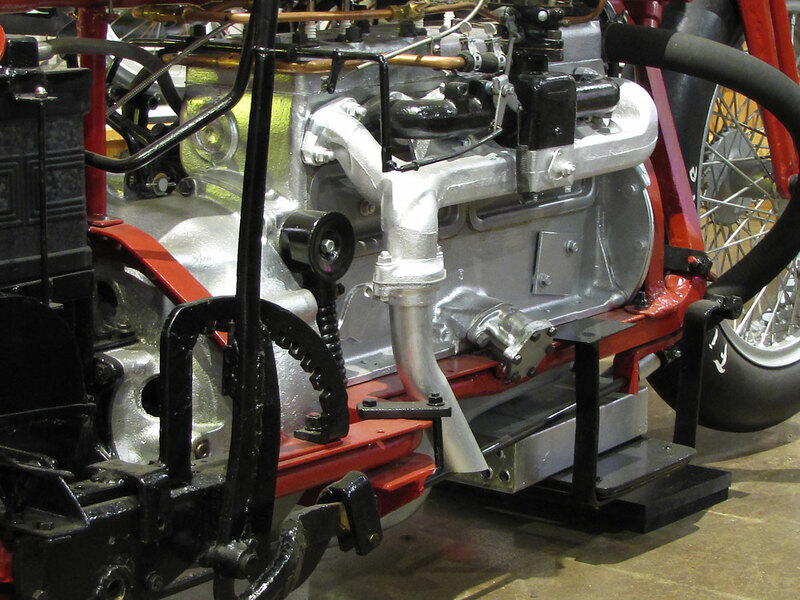 There is a possibility that Fred Offenhauser was involved as his dyno was used to record 122HP in final race-ready configuration. 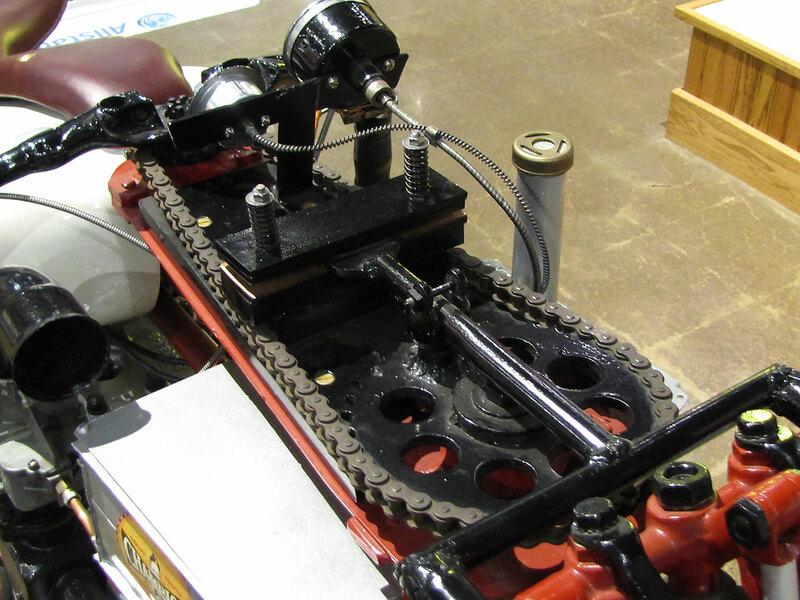 The Henderson transmission was used feeding to an enclosed “silent chain” about 2.5 inches wide. 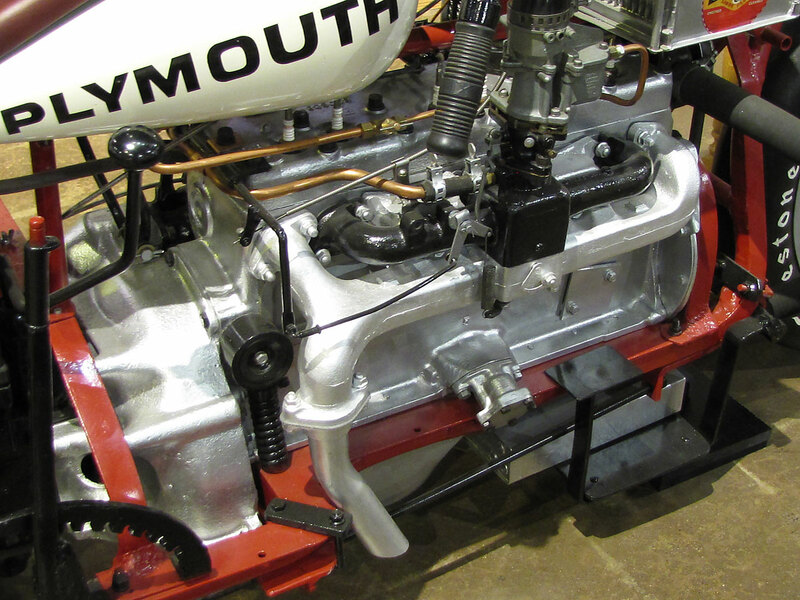 Adolf Thuillier adapted the Plymouth engine into a Henderson frame, but that involved a lot of stretching and reinforcing as the motor was wide and twice as long, likely three times the weight of the stock Henderson four. 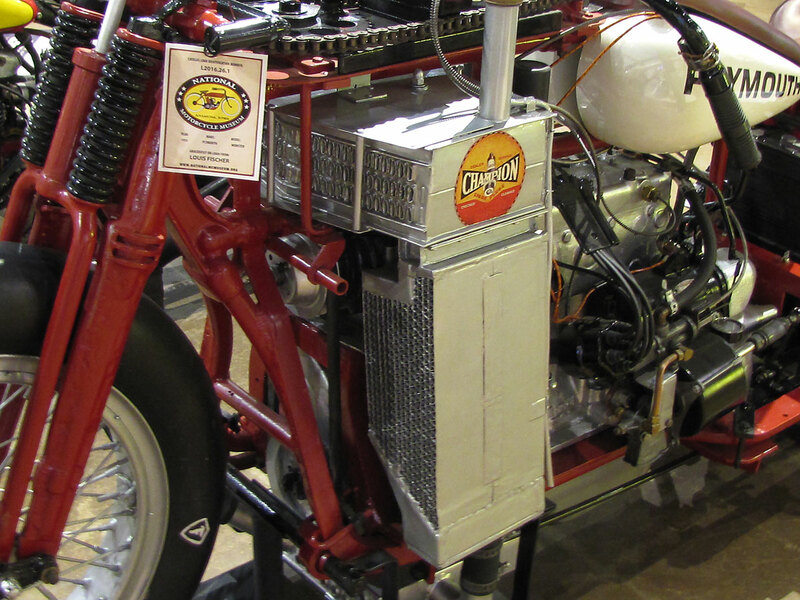 In the end the machine weighed about 1500 pounds and had a 105″ wheelbase; almost twice that of a Harley-Davidson dresser. 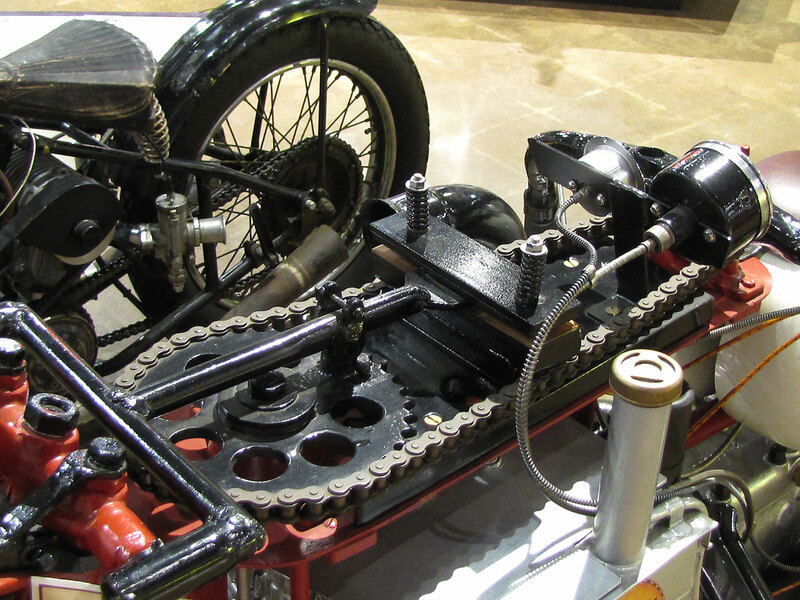 With the rider seated behind the engine, it was such a reach to the reinforced Harley-Davidson forks used that steering was by a jackshaft of sorts, two sprockets connected by a roller chain! 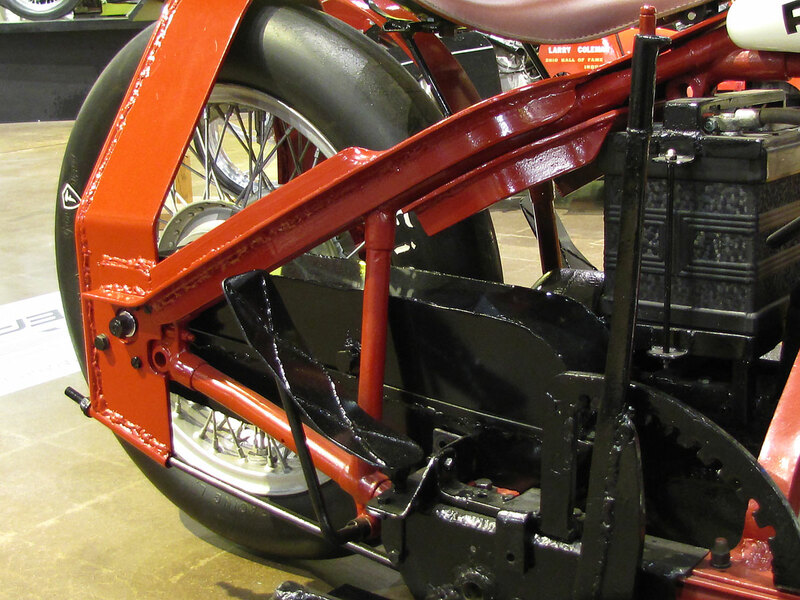 Skids at the rear could be deployed for low speed running and were used in the pits. As can be seen, welding, reinforcing seemed to go amok; torches flared as 20 tanks of acetylene were said to have been burned through! 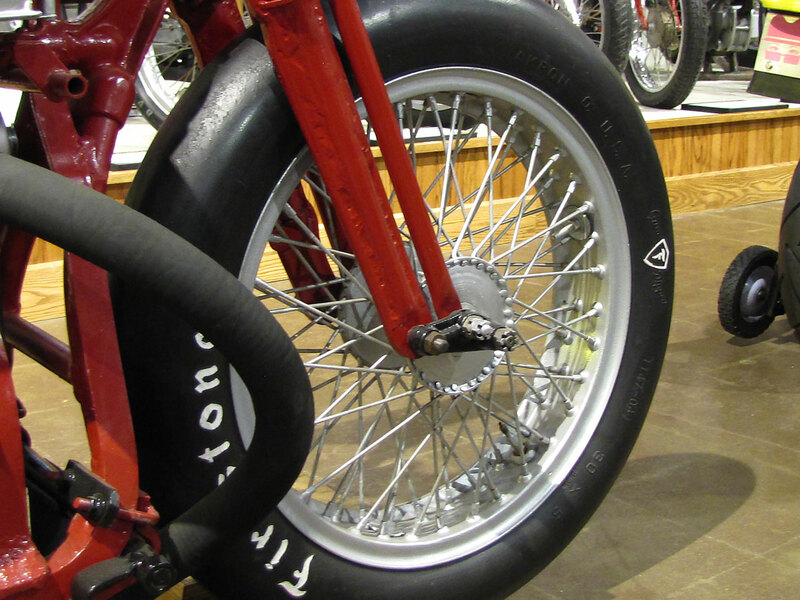 Firestone helped Luther in his earlier days and built special 8 ply tires for the effort, 30″ x 5″ in size. 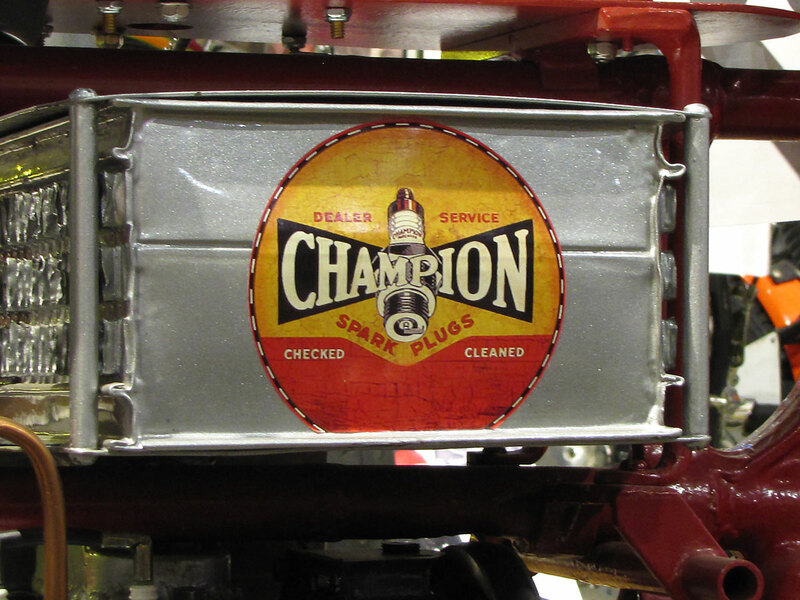 Gilmore blended and donated what they called “80-Fast” fuel. 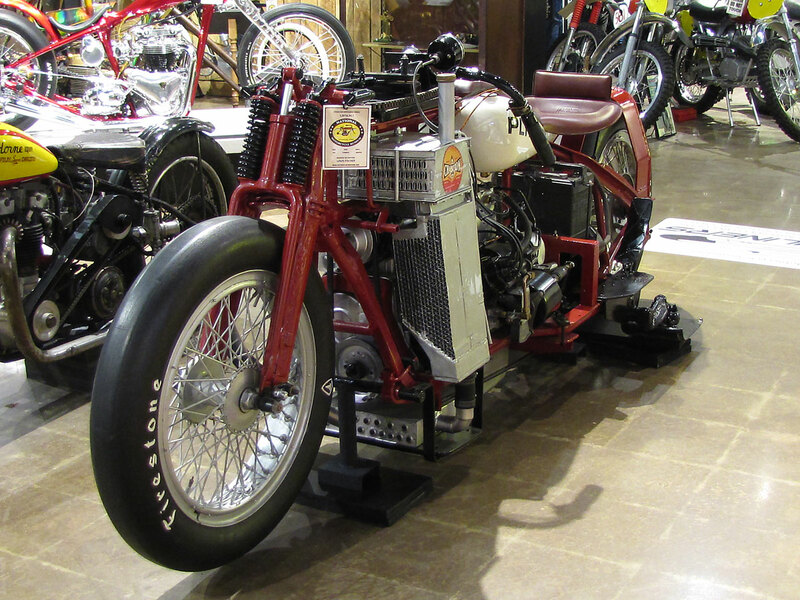 The Monster was “bench tested” in Luther’s California shop, then he and Thiullier loaded up for Bonneville. 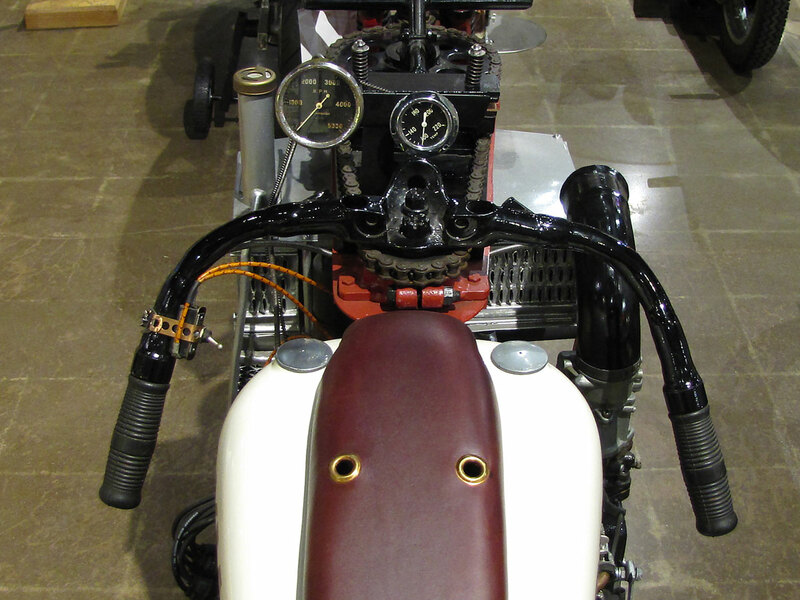 As you may know, the “salt” conditions at Bonneville vary year to year. For the July 1935 run, 13 miles were available, about as good as it gets. 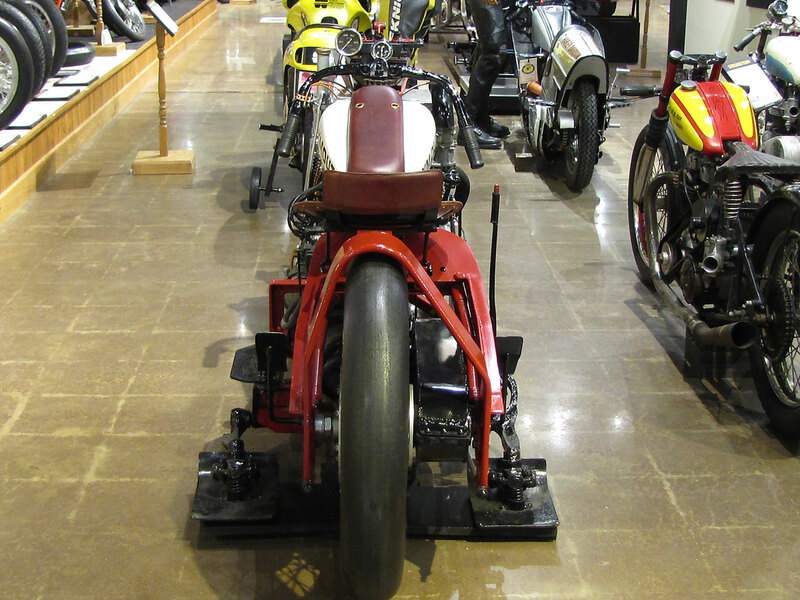 Luther had to wait his turn as Sir Malcolm Campbell’s Bluebird was at Bonneville as well, broke the 300 miles per hour record for cars. 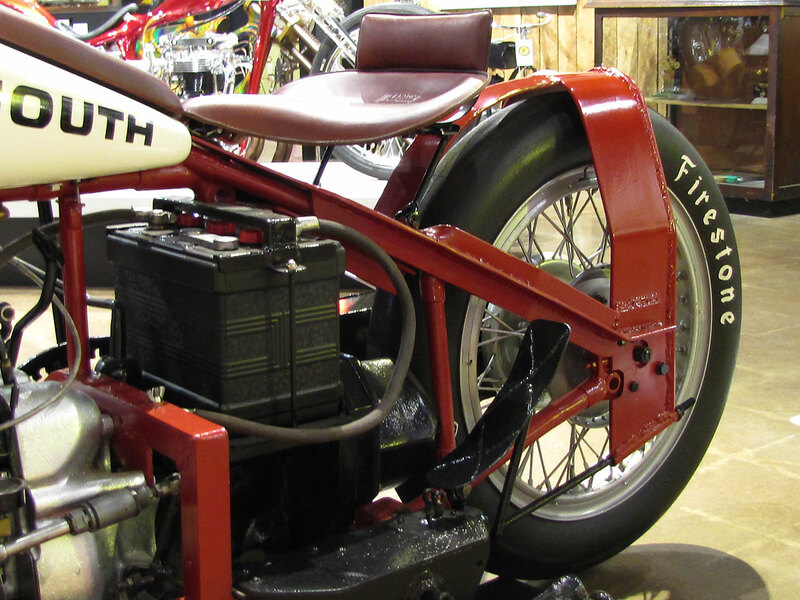 Luther’s first pass was about 140, but as the bike was running about 180 on the return pass, a rod broke, went through the crankcase ending the effort with a 160.33mph average. 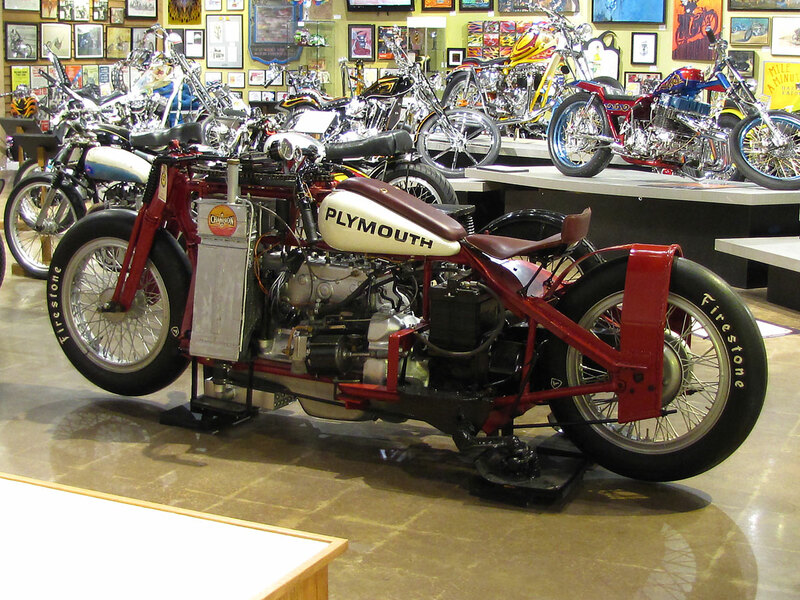 Regardless, this is one extremely cool machine, so much so that it graced the pages of Popular Mechanics several times; 1935, 1950 and 1971! “MONSTER PLYMOUTH ROCK(ED) THE RECORD” was the cover sub-head in the 1950 edition. 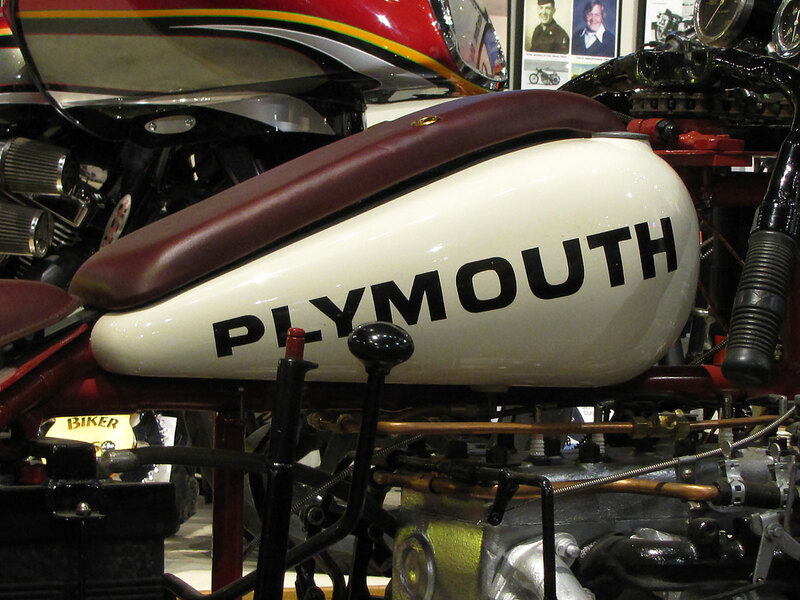 Today on loan to the National Motorcycle Museum from Lou Fisher, the Plymouth Monster graces the Allstate Motorcycle Insurance STREAMLINERS exhibit, presented by J&P Cycles. 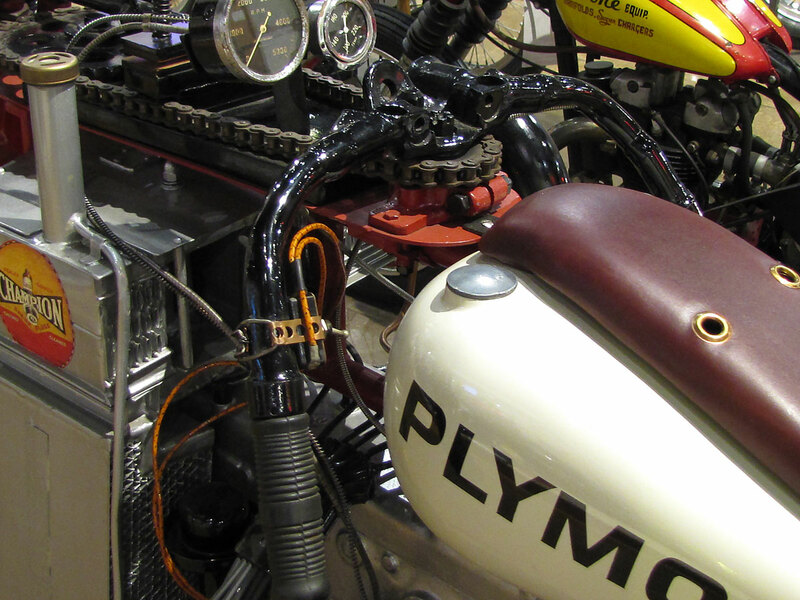 While the exhibit includes fine streamliners built by greats like Rick Vesco and Denis Manning, somehow the off-beat Monster gets most of the attention. “HEY! 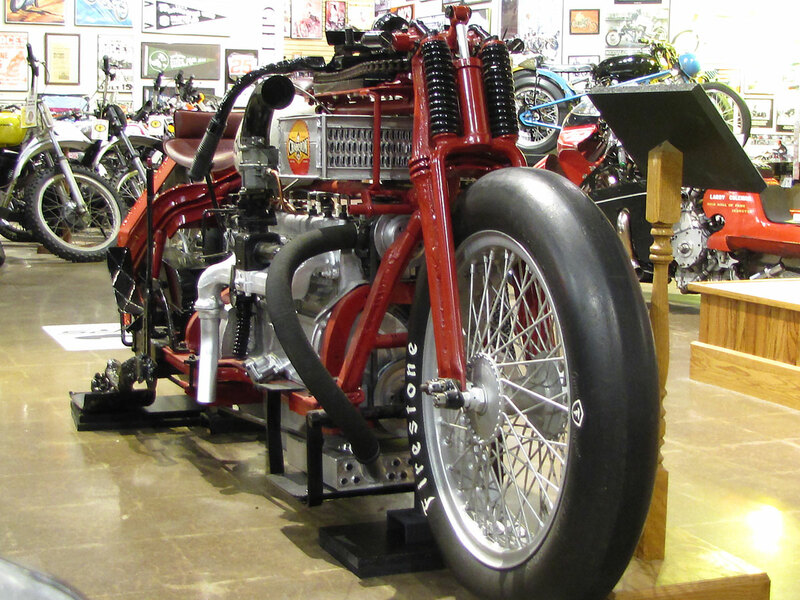 LOOK AT THIS THING!” are words often heard as visitors come upon one of the most outrageous land speed record bikes ever built. 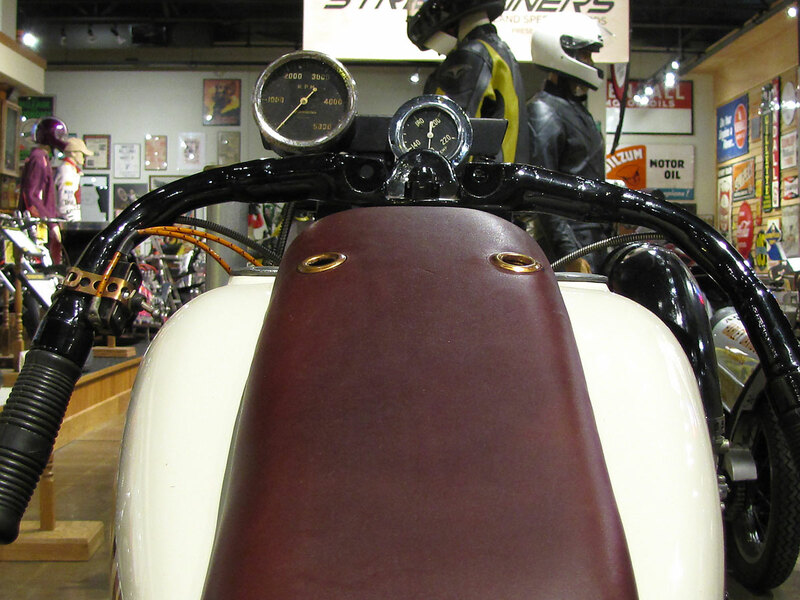 The STREAMLINERS exhibit will be in place through mid-May 2017, so don’t miss it. 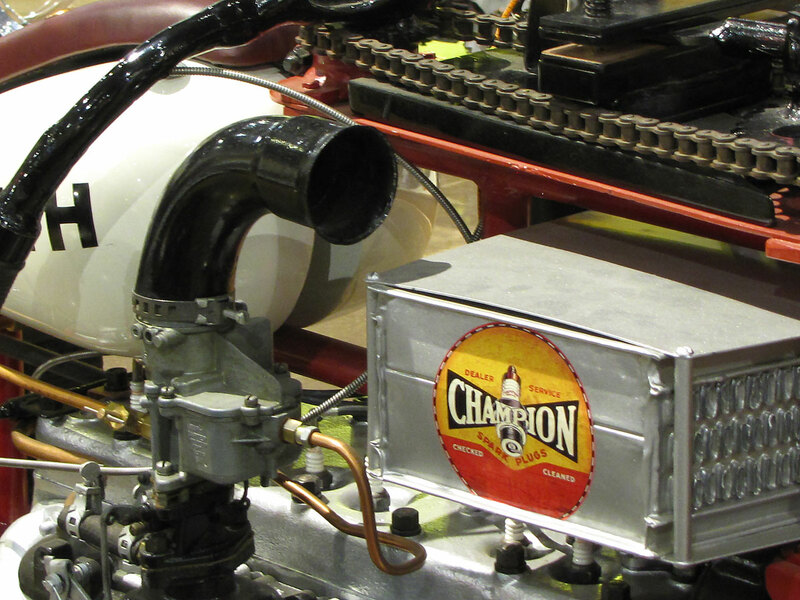 This is what innovation was all about, it drove the industry. And, it is sorely missing from so many of today’s sanctioning bodies. Beautiful, just beautiful. I love the stuff you guys come up with. Keep up the great work. Thank you Dany! 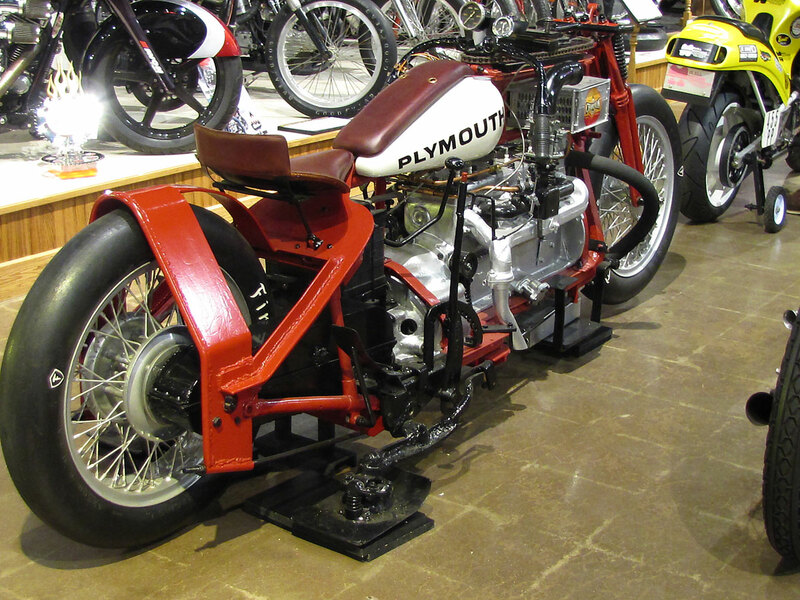 There are so many amazing things in the National Motorcycle Museum to share with everyone! Stayed tuned for more to come!! There ain’t no schoolin’ like OL’ SCHOOLIN’ Way ( KEWL ) !!!!!! You guy’s made my day !!!!! !